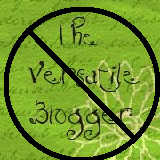 That is to say...I about choked READING your blog with laughter! There is nothing wrong with the 4th place out of 4 teams bowling trophy. I proudly display mine next to my "Tried pretty hard" trophy on the mantle. Glad you're feeling better. And that's a great shot of Suldog! Hee-Hee. I am suitably honored (whatever in hell THAT might mean in this instance.) I bow before you for some reason or another, possibly my inferiority complex. And I thank you for the award. If my new teeth ever break, I'll be around to kidnap your dog. Thank you. Don't mind the guys outside. They're just watching you through the window. Feel better soon. Maybe you have AIDS? Or the clap? Regardless, feel better soon! Try posting a toilet in your sidebar? 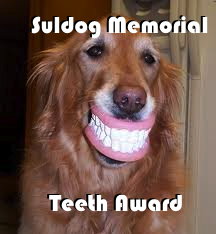 It appears you just got away with giving Suldog an award. Nice going. Oh that is nasty sick, you poor thing.